Originally conceived a dozen years before painting it, Michael studied and photographed carousels on his travels, the final inspiration being the one in New York City's Central Park. 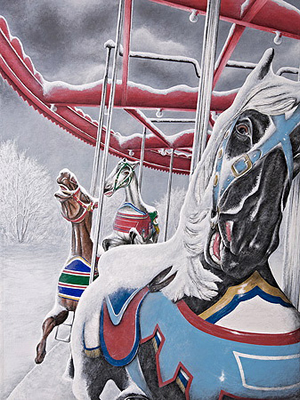 Capturing the wonderful, full-color vitality of a carousel, Michael presents it in a way seldom seen, frozen in a cold, stark winters day. We are happy to share the news that the first edition of the carousel is now closed. Our affiliation with Wentworth Gallery offers a new edition. Please click on the Wentworth link for more information.